This excellent, informative and well presented, a book provides the reader with fourteen edited chapters covering an area of policy and practice that is quite specific but will inform anyone interested in the development of a service user participation ethos in adult social care. It is a book that is relevant to managers and practitioners, both as students and qualified professionals, as well as academics. Care management is now well established in the everyday practice of predominantly statutory organisations. This book revisits the principles of this method of assessing and planning the care needs of adult service users, and introduces Person Centred Planning (PCP) as a suitable method for ensuring that much of the empowerment rhetoric care management is actually realised.' - British Journal of Social Work 'Part of the attraction of this book is its strong practice component. This is applicable to the different professionals working with people with learning disabilities, in whatever their service configuration. For students, the book will also provide a good introduction to the impact of person centred planning and its connections to a long history of similar initiatives.' - Journal of Interprofessional Care 'This book is a stimulating and challenging read of those working in service development generally, as well as learning disability services. There is a potential broad care management readership that might also find this relevant and interesting.' - Journal of Interprofessional Care 'This is an important book. It brings together chapters by many of the foremost researchers and practitioners in person centred planning. The book contains many ideas for taking the PCP process to a higher level of sophistication to really underpin the future development of appropriate and effective services.' - Community Living 'This book will help social workers to reconnect with the core values of their profession and to challenge institutionalised policies and practices. It has proven to be a valuable teaching resource and whilst its focus is on people with learning disabilities, the principles of PCP that it raises are relevant to any service user group and social work arena. Highly recommended.' - Professional Social Work 'There are many important issues facing the care management system today in the light of person-centred planning and approaches, and you would be hard-pressed to find a better collection of insightful and radical thinkers in this area than those featured here. It asks hard questions, and challenges the professional to adopt more inclusive and accessible work practices. Wherever you work in the field of learning difficulties you should read this book carefully and aim to put "person-centeredness" at the core of your practice.' - Community Care 'You would be hard-pressed to find a better collection of insightful and radical thinkers in the area of care management. Wherever you work in the field of learning difficulties you should read this book carefully and seek to put "person centredness" at the core of your practice. The challenge for professionals, is making it a reality for individuals.' 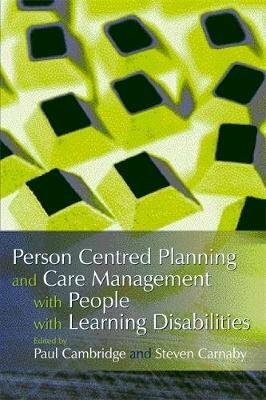 - Community Care This timely book provides a reflective analysis of person centred planning for people with learning disabilities, complementing policy initiatives that focus on individualised planning and service user involvement. Drawing on practical experience and research findings, the contributors explore policy and practice issues, including: * advocacy and empowerment * risk management and adult protection * inter-agency and inter-professional working * ethnicity and culture * de-institutionalisation. Vivid case studies illustrate best practice in person centred planning, and the authors offer a rich variety of ideas for increasing the participation, self-esteem and quality of life of people with learning disabilities. This practical and accessible text is an invaluable guide for policy makers, carers and social work managers, academics and students.